The three principle aims of this substantially enlarged and revised volume are to define standardised patterns of meat cutting and ethnic variations, to provide a ready reference to the mainstream muscle foods available commercially or being developed scientifically around the world, and to help explain the properties of different meat cuts and muscle foods in terms of meat quality. 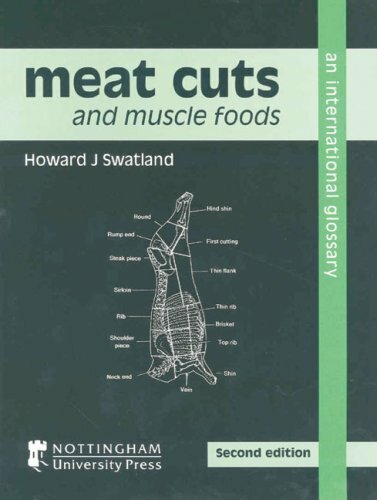 This book provides a guide to many of the myriad of meat cuts and muscle foods now widely available internationally. Cutting patterns for beef, pork, lamb, game, poultry and fish are featured, plus a number of invertebrates such as crabs, lobsters, shrimp, squid and scallop that also produce straited muscle. Wholesale and retail meat cuts are described and cross-referenced - many being clearly illustrated and labelled - so that the reader may start with a country, or with the name of a specific meat cut to find the country of origin. In addition, the key scientific concepts required in understanding food myosystems are briefly outlined. For this second edition, information for ten countries has been added or expanded, bringing the total to 51. Languages added include Urdu, Yoruba, Ibo and Hausa, plus many extra names in Arabic and Latin-American Spanish. Also, the entries for deep sea fish have been increased. If you have any questions about this product by Brand: Nottingham University Press, contact us by completing and submitting the form below. If you are looking for a specif part number, please include it with your message.